2014 has been marked by learning, study and inspiration, all stimulated by the discovery of The Liberated Body Podcast. Host Brooke Thomas is the Terry Gross of the Podcast world. Through Brooke, I have been introduced to a world-wide community of somatic researchers. Thank you Brooke! Interviews with Tim Anderson and Geoff Neupert, founders of “Original Strength.” Their thesis is the same as F.M. Alexander’s: “If we master head control, then we master balance, posture, and coordination.” You might find yourself rolling on the floor like an infant after listening to them! Judith Hanson Lasater’s passionate (and research-based) plea for more rest. The discovery of Matthew Remski’s WAWADIA project (a.k.a. What Are We Really Doing in Asana). This is a must for anyone who has ever questioned alignment cues in yoga. Then there is Jules Mitchell’s scientific investigation of stretching, Katy Bowman’s examination of the effects of mechanical force on cellular health, and Gary Ward’s expertise with walking. There are just too many interesting interviews to describe. You’ll have to check them out for yourself. One caveat: not everyone interviewed has a firm foothold in science, let alone critical thinking. A particularly painful example of credulity is the interview with Carolyn McMakin, titled, The Resonance of Repair. Yoga and Beyond, with Ariana Rabinovitch – very similar to the Liberated Body, but obviously, with more emphasis on yoga. Katy Says – interviews with popular Biomechanist Katy Bowman. Although the patter between host and guest can be grating, the podcast offers many tips for bringing a more varied diet of movement (versus exercise) into our lives. When I get tired of thinking about bodies, I turn to Ginger Campbell’s technically intricate Brain Science Podcast. When I need guidance on how to live with less stress, pain and negativity, I tune into psychologist and Buddhist teacher Tara Brach. When I need my mind blown open, I listen to Buddhist teacher Reginald Ray. I would be remiss if I failed to plug the one and only podcast devoted to the incredible Alexander Technique! Check out the Body Learning Podcast. Vary sitting and standing positions. If you are working at home, try sitting on the floor or even lying down. Check in with yourself at least once every hour. Ask yourself: “What am I doing with my body right now? 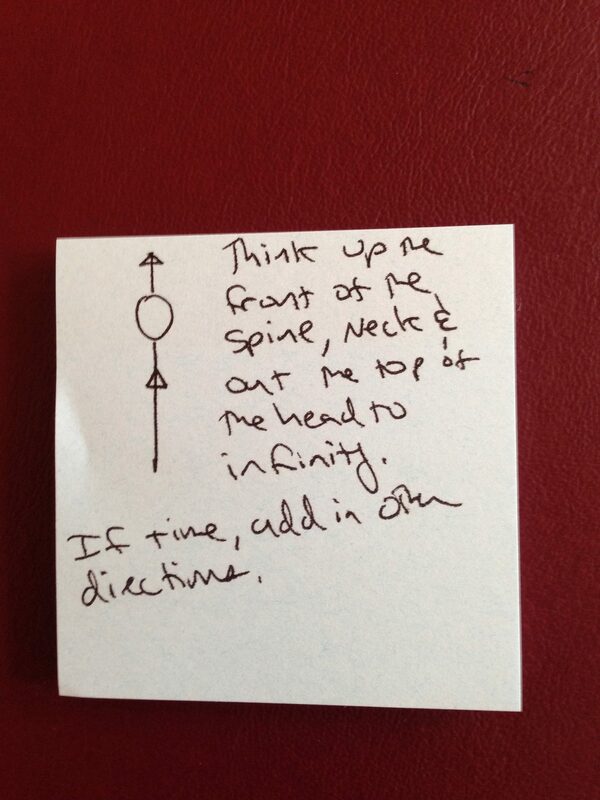 Hone in on the particulars of what you are doing with your neck, head and spine. 3. If you check in 8 times a day for one week, that will be 56 mini practice sessions. You will be that much closer to body awareness and control. Think your directional thoughts as you walk. Research shows that the Alexander Technique combined with walking is an effective means of ending back pain. 5. Look into the distance. Look at least 100 feet away. Look up, down, and around. Try to see things you’ve never seen before in your familiar environment. Become aware of peripheral vision. This will help counteract eye strain, and resultant facial and neck tension caused by hours of screen time. Alexander Technique uses the power of the mind to guide physical change. Where our thought goes, our body tends to follow. 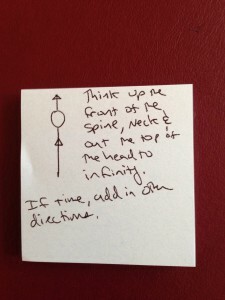 You can relax into effortless spinal length by using your imagination. You don’t need to do anything muscularly. 1. Imagine the head delicately nodding yes to clear the space at the back of the neck and lift the crown towards the sky. 2. Imagine the upward direction of the spine and head. 3. Imagine the outward direction of the collarbones. Sometimes it helps to picture a glowing jewel on your sternum, so that the space in the front of the chest expands. Avoid arching the spine or lifting the ribs. 4. Imagine the arms gently spiraling open. This will help free and clear the shoulders. The directional thought should be so light that it causes no strain. If you try too hard, you will experience tension. When this happens, stop. Take a break to calm and quiet yourself. Then practice with a lighter attitude. Usually, it takes a teacher’s touch to understand direction on a sensation level. For now, you can imagine your body as free flowing water. Prioritize a sense of upward flow through the central axis of the head and spine.